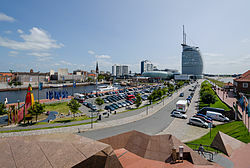 Bremerhaven (German pronunciation: [bʁeːmɐˈhaːfən], leeterally "Bremen's harbour", Law German: Bremerhoben) is a ceety at the seaport o the Free Hanseatic Ceety o Bremen, a state o the Federal Republic o Germany. It furms an enclave in the state o Lawer Saxony an is locatit at the mooth o the River Weser on its eastren bank, opposite the toun o Nordenham. Thou a relatively new ceety, it haes a lang history as a trade port an the day is ane o the maist important German ports, playin a crucial role in Germany's trade. ↑ "Bevölkerungsstand und Bevölkerungsbewegung am 31.12.2015" (PDF). Statistisches Landesamt Bremen (in German). July 2016. This page wis last eeditit on 4 Mairch 2018, at 21:21.